The plan will allow people to reverse part night lighting for the complete length of any named street. It comes as the county council controversially switched off more than half of the region’s 68,000 street lights over a year ago for part of the night in an effort to save the authority £1.7 million. Under the proposals, parish councils will have to apply to the county authority to reverse the change. It means they will have to pay £300 per light if the switch-on does not fall within a routine council maintenance programme. However, if the proposal falls within that period, then it will cost the parish £150 per light. 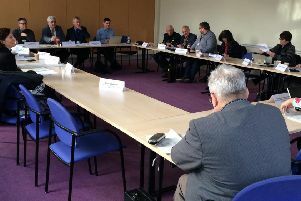 Councillors on the authority’s Highways and Transport Scrutiny Committee have been recommended to support the policy at a meeting on January 21. The move to change the policy was backed by the senior councillor for community safety, Coun Barry Young, who said he “enthusiastically” supported the plan. Meanwhile, chairman of the council’s scrutiny management board, Coun Rob Parker, said the plan will provide an “opportunity” for local people. Cooun Richard Davies, executive member for highways, said he believed the changes address any concerns about the policy. He said: ”Although we’ve seen no evidence that part-night lighting has had a negative impact on people’s safety or crime rates, we realise some people are still concerned about the changes.